In the Bookworm's Universe, reading crime novels is an exception rather than a rule. Deep down I feel that if you've read one whodunit, you've read them all, and it takes someone of awesome genius to take the genre to a higher level (e.g. Terry Pratchett. Some of the Discworld novels are, in fact, crime stories). Having said that, I do not regret the decision to read and review M. G. Scarsbrook's Dream of the Dead (at the author's request). Yes, it may not be entirely my kind of a book. I'd probably find more pleasure in getting acquainted with some of his non-fiction titles (Scarsbrook seems to specialise in the history of the infamous Borgias). Still, the crime story was a decent read and it matched my mood at the time pretty well. Light, pleasant and gripping - I call that a fair deal. 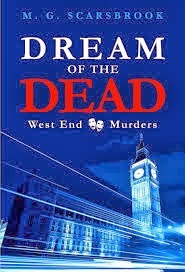 Dream of the Dead kept me captivated throughout all of its 270 pages. A fast-paced, seamlessly forged story, with a likeable protagonist and occasional linguistic pyrotechnics. Scarsbrook's command of language is quite impressive, although I admit that occasionally I muttered a half-laughing 'show-off!' under my breath. Kallipygous, dear author? I happen to have studied classics and to me the word is both familiar and of sentimental value, but for an average bestseller-consumer it might be a bit of an oversell. Seriously though, when it comes to pure wordsmithing, Dream of the Dead is spotless. The plot is... well, phrases like 'regular', 'technically correct', 'fairly decent' keep milling through my head; none of them hits the bull's-eye, but together they paint a more or less accurate picture. On first reading, I could find no major holes in the storyline (and believe me, I looked hard), which is always a good thing. A suicide turns out to be more than it seems, soon there are more corpses, more suspects and many more complications. The protagonist has a History, which flashes through the pages and hints at more books coming soon. Add a dash of corrupted officialdom, a drop of the supernatural and you end up with quite a digestible mix. Fair enough. Entertaining. Not sugary-sentimental (thank you, thank you oh-so-much for not developing the romantic potential!). Then again, we all have to eat. I'm fairly certain that whodunits sell better than historical biographies. Plus, most people probably expect a crime story to be just that, nothing more. They, at least, should be completely satisfied.